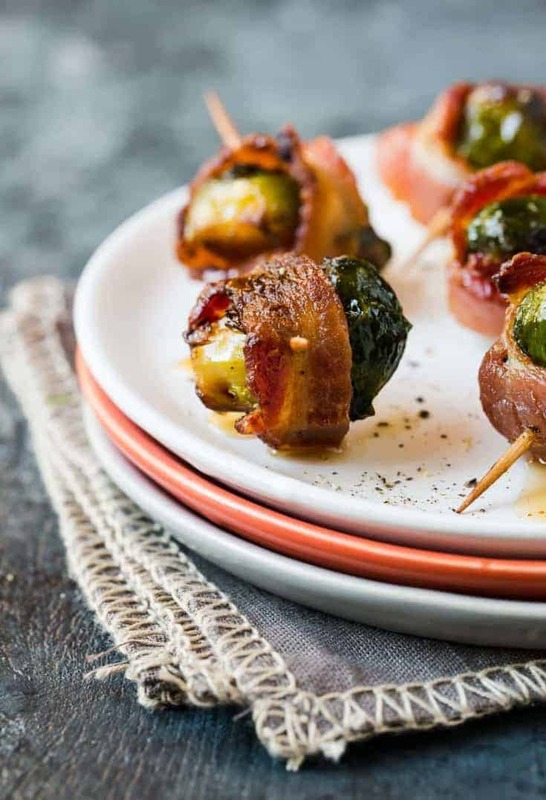 These 4-ingredient Bacon-Wrapped Brussels Sprouts with Maple Syrup can be prepped in advance and cooked right before serving for a quick and easy holiday appetizer. Salty, sweet and savory – has there ever been a better flavor combo? With just four ingredients and most of the heavy lifting done in advance, these Bacon Wrapped Brussels Sprouts with Maple Syrup are a fantastic addition to any holiday appetizer spread. Do a little bit of prep work for these sprouts the morning of your party to save yourself assembly time before guests arrive. 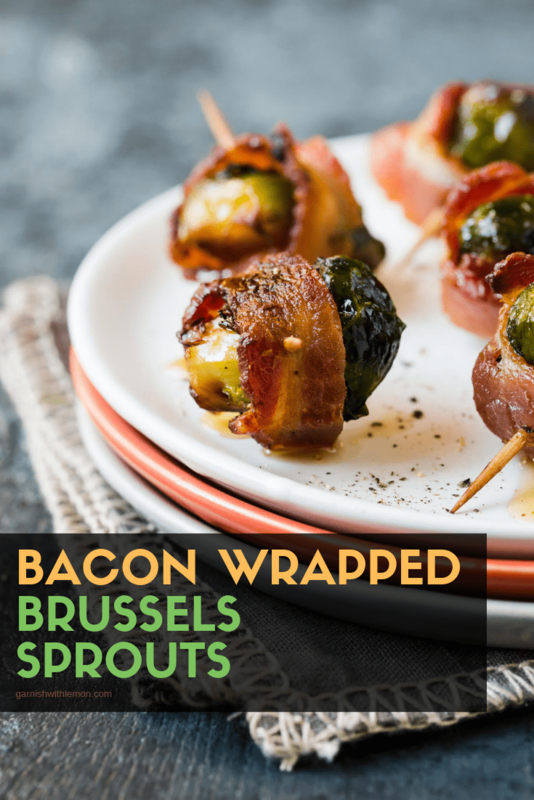 You can parboil the brussels sprouts and par-bake the bacon to shorten the baking time later on. Simply assemble the prepped sprouts and pop them in the fridge until party time. Bake the skewers right before your guests arrive, and you’ll have the enticing smell of bacon greeting them as they walk in the door. Finish your dish with a drizzle of pure maple syrup and a few sprinkles of freshly ground pepper. Tip: The baking time can vary a bit depending on the thickness of your bacon. I used thick cut bacon, so they took a little longer to crisp up than if you used regular sliced bacon. The directions reflect my baking time. Keep an eye on them if you use a thinner slice. 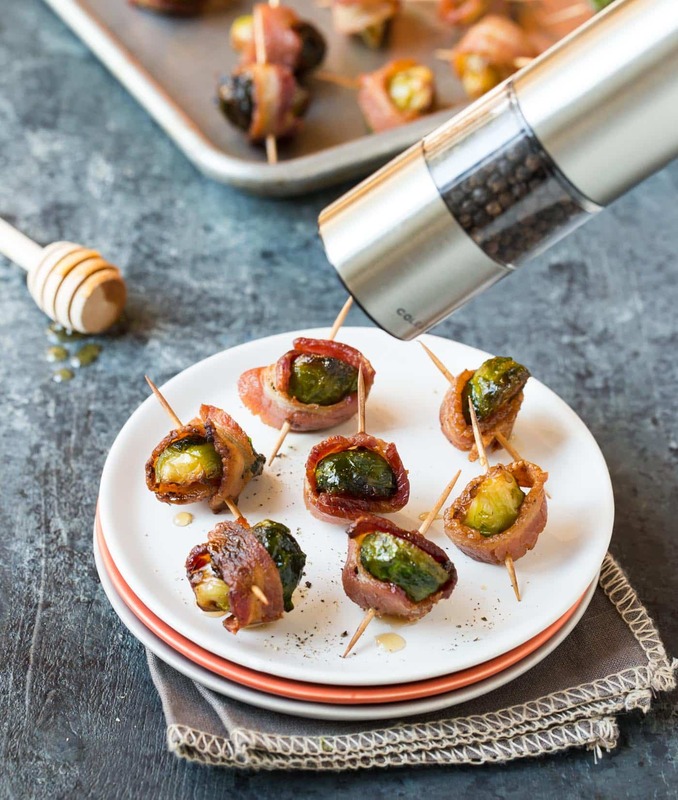 Everyone can use an extra appetizer recipe in their back pocket this time of year, so make sure you pin these make-ahead Bacon-Wrapped Brussels Sprouts with Maple Syrup! These 4 ingredient appetizers are easy to prep for a party. Bring a pot of water to a simmer. Add sprouts and cook for 8 minutes. Drain and set aside. Cut in half lengthwise when cool enough to handle. Fry bacon until starting to brown but still pliable. (I cooked in batches so I didn't crowd the pan.) Drain bacon on paper towel and then slice each bacon piece in half lengthwise. Return brussels sprouts to the same pan you cooked the bacon in and saute for 2-3 minutes. Remove from pan and wrap each sprout half with a piece of bacon. Secure with a toothpick. Repeat with remaining sprouts. Cover and refrigerate for up to 12 hours. Serve warm drizzled with maple syrup and sprinkled with ground pepper.